NOT IN THE "BIG BOX" STORES! BOB LINK GETS HIS BEAR! 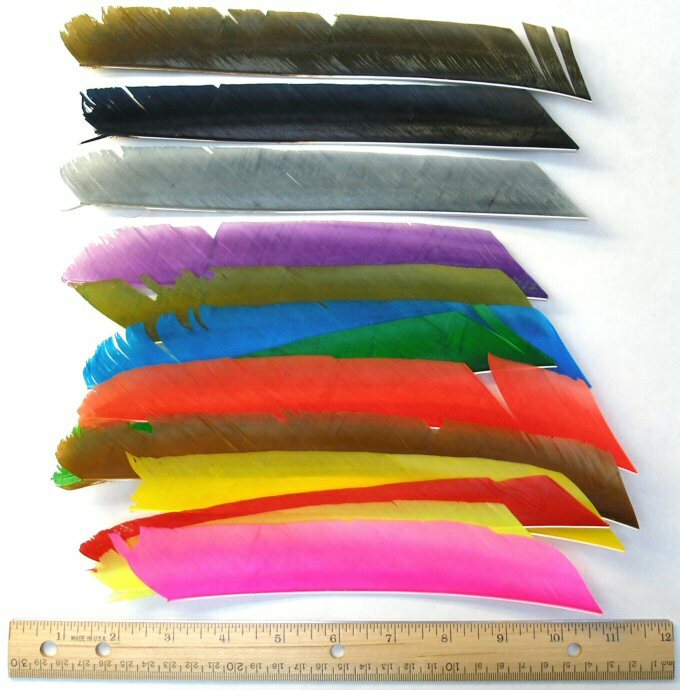 Trueflight Feathers are Certified Feathers! All Trueflight Feathers are produced, processed and packaged entirely in the United States. Further, all of our raw feathers are from birds raised commercially on USDA regulated turkey farms. The feathers are clipped from the birds in US turkey processing plants which are USDA inspected, with Federal inspectors on site. Trueflight's own processing plants are also subject to USDA inspection. The USDA is a Federal Agency, which independently certifies that Trueflight Feathers are clean and disease free. 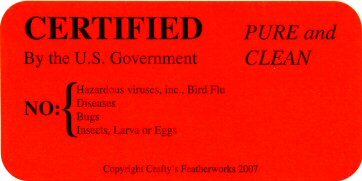 When you buy Trueflight feathers you can be confident that our feathers are free of "bugs", and disease, including BIRD FLU. Trueflight Feathers contain no hazardous or toxic chemicals. Our dyes contain no heavy metals or other health or environmental hazards. Our competitors, unfortunately process their feathers in China and Mexico. Environmental, health, and product safety standards there are not the same (IF THEY HAVE ANY AT ALL!) as US standards. Neither are worker health, safety, and wage and hour laws. Small Feathers? Yes, We Have Them! Are you a fan of short, small fletchings? Sure, we've got them! 1.5", 2", 2.25", 2.5", 3" some high, some low, some used mainly for darts. If you're shooting bullet or field tip arrows they fly quite well. But there's a vast difference between these heads and a broadhead! From scientific point of view as well as a common view point, there are many disadvantages to small fletching with broadheads. 1) A broad head any broad head, even collapsible represents a steerage surface up front. The slightest, minute offset will cause an arrow to depart straight flight. That is why you need a large amount of steerage in back. 2) You need to spin a broadhead to "average out" these offsets, just like rifling in a gun barrel spins a bullet. That's the purpose of helical fletching. 3) Because of the small surface area of small fletching, more time and distance is needed for the arrow to "spin up" to it's normal rate of rotation. Stability suffers. Reduced stability means less tendency for the arrow to stay pointed in a constant direction. This is not good at all. The "shotgun" approach doesn't work in archery! 4) For typical modern archery equipment with carbon arrows and powerful compound bows, 4 inch feather fletching proven itself to give excellent arrow flight, high arrow speeds, plus "fold down forgiveness" with broadheads. We have heard reports that feathers smaller than 4 inch will guide a broadhead equipped arrow in some cases. But this is "pushing the limit", and giving up some "forgiveness". 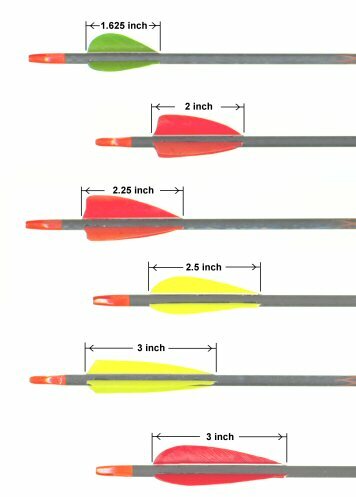 We strongly feel there is little or no advantage in smaller fletching, while there are many very serious disadvantages. You won't find Trueflight Feathers in those "Big Box" stores. Our market has always been and continues to be specialty archery dealers. We believe in the "quality" end of the market, not in the "mass sales" end. We've always believed that more experienced archers are likely to be shopping at archery shops, looking for top quality service and equipment. As an archery dealer, this means you have an "EXCLUSIVE" in Trueflight Feathers. Quality sells. I'm sure we could have lots of sales to the "Big Boxes". All we need to do is cut the price and lower the quality. We'll leave that to others. Years ago, we were able to routinely cut two 4 inch feathers from each raw turkey pointer we purchased. As the years passed, the quality of raw feathers steadily declined. Turkey farms raised more of the birds indoors (in "pole sheds", for example) where the birds did not develop good feathers. The feathers which did develop on the "indoor" birds were beaten to junk status well before the birds were mature. Feeding programs for turkeys were adjusted for maximum meat growth in the shortest possible time. This also was not good for feather growth. In time, we no longer found raw material good enough to double cut 4 inch die cuts. The best we could do was a 4 inch, plus a 2.25 inch. In recent years, even that proved impossible. We resorted to single cutting 4 inch, 5 inch and sometimes even 3 inch. Cutting a single die cut from each ground feather raises costs and slows production. But we had no choice. The part of the web that is not well developed does not make for good archery fletching. We can't use it. As this was happening, we were able to find fewer and fewer ground feathers meeting our standards for "Select Full Length". We tried very hard to pick full length good enough for multiple cuts. Only a very small percentage of ground feathers came close. Finding these became enormously expensive... and frustrating. There simply aren't enough raw feathers available any more to meet our "select" standards. Because of these circumstances, we have been forced to replace our "Select Full Length" feathers with "Commercial Grade" feathers. "Commercial Grade Full Length" have the same finely ground base, and brilliant colors you expect from Trueflight Feathers. However the minimum amount of useable web (suitable for strong archery fletching) is 5.5 inches for "Commercial Grade". The 5.5 inch minimum standard insures that the full length can be used for the longest, highest archery fletching. It may be possible to cut more than one shape from a single "Commercial Grade", indeed, some very long "Select Full Length" may be included but we cannot GUARANTEE more than a 5.5 inch minimum useable web length. We are sad to end "Select Full Length", but one plus is that the new "Commercial Grade" are much easier to find and produce, which allows them to be priced substantially below our "Select Full Length" price. In the long run, we believe this is a good trade off for our customers and for our hard working production people. Our warmest greetings to all of you. A giant thanks for giving us the privilege to serve you. It's been a tough year for many folks, including us. We are all very thankful to be working, unlike so many of our neighbors. We are all hopeful that all those who are suffering the effects of our poor economy will soon return to their jobs and normal way of living. In 2009 there will be a change. When it comes to our select full length feathers, select full length will no longer be available and we will now offer you a commercial grade of full length. I'm sure you're wondering why we are discontinuing the select grade. The simplest way to explain it is that those near perfect long primary feathers are just not available any longer. Our grinder operators average about 200 - 300 select from a tub of 4,500 feathers. In a ten hour shift, an operator will sort through at least 4 to 5 tubs of feathers (25,000). Our goal is to get at least 2,000 select feathers by the end of the shift. Lately, it's been tough to get 1,500. I'm sorry to say this is one area that has been impossible to hold down the cost. If we stayed with it the way it is, we would have to charge almost twice the current price. I'm sure the commercial grade will be able to fulfill your full length needs. The best part is that they will be less expensive. Just under the 4" price. I would like to reassure you that you will still get 100% usable feathers in our stock boxes, however, they will be shorter and some will have a few minor flaws. Nothing that you won't be able to work around. You will be able to get at least one 5 �" cut from each commercial grade feather. As always, we will stand behind our quality. You can also count on the best quality possible from our operators. Thank you for your continued support of Trueflight Feathers. Despite the high cost, they're still a good deal when you think about the other costs of those completed arrows. By the way, in the event of a lost arrow, they are the only part that will be accepted back to the soil in a short time. Great fertilizer! Now, you all know why your feathers are so very important. Let's all have a good year, blessed with much joy and happiness. Next early spring, when you're starting to get cabin fever, you might want to try your luck at shed hunting. My family and I started to shed hunt about 5 years ago and I'm happy to say that is has been an annual family event for the Links every year. We usually go in late February or early March. In fact, we devote an entire weekend to it. Best of all, just about anyone can participate, including the dogs. It's also about the only hunting that you can do without purchasing a license. 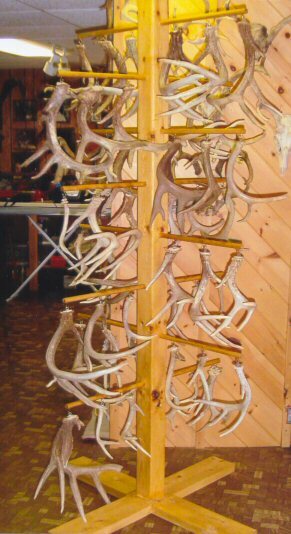 When we first started shed hunting, it was a big deal for us to find a few, but with every year we found more sheds. It didn't hurt to attend a few seminars where we picked up a lot of good tips from the experts. Instead of starting in April, we started late February. Last year, because of all the snow, we were not able to go until the first week in March, which turned out to be a very good thing as we found 26 sheds, all from different bucks except for a matched 8 point set. I'm sure, for the experts that's not a lot, but for us, that was fantastic. Just a couple of things I would pass on to you. For example, you'll probably have more luck in the agricultural areas versus the forest areas. Sheds don't last very long in the wooded areas as squirrels, porcupines, and other rodents can take down a good size shed in a short time. Sheds found in the open crop fields or CRP are usually found untouched as these critters are less likely to venture out into the open fields for fear of raptors. Search those thick areas where bucks like to bed. Check trails leading into any crop fields. Sunny hillsides that fact the south can be very good also. Cut over corn fields are good but they're really tough to spot among all the corn stalks. Any heavy packed deer trails need to be checked. Any spot that requires a deer to jump, like a fence or creek should not be overlooked. One of the biggest mistakes we made when we first started out was that we looked to far ahead. Keep your search to no more than 20 feet ahead as you will find that sheds blend in with the forest floor more than you would think. I always thought that they would jump out at you against the ground. Sometimes they do, but I'll bet we missed a bunch because they blend in so well. Of course, dress for the weather so you stay comfortable without sweating. Having good footwear is also very important as you can easily put on 10 miles in a day. I always tell the kids in our youth hunting program that finding a shed antler is a close 2nd to getting that deer during the season. Now I know why one of the writers referred to them as "White Gold" as I think they truly are. Guess what? J & M Traditions has brought out a new DVD, "Advanced Arrow Building" which takes much of the mystery out of those "show arrows". In this DVD, Jim Rebuck shows in great detail some of the "professional" techniques used to make his award winning arrows. Aside from the basics of neat glue lines, and accurate jig alignment, Jim shows how to apply "marbled" cresting, make multi spliced feathers, and apply beautiful finishes. And, no there is no magic involved. It's all a matter of patience, practice, and following his instructions. The DVD shows very thorough, yet easy to follow examples. Just about anyone, even experienced arrow builders, will pick up some tips and new ideas for the making of arrows of any level of "fanciness". My own arrows still aren't quite in the same league as Jim's, but the quality and appearance of even my "work a day" test arrows has noticeably improved. I'm still working up to "show arrows". Meanwhile the DVD has given me the encouragement to know I can make some pretty darned fancy arrows with a bit of effort. 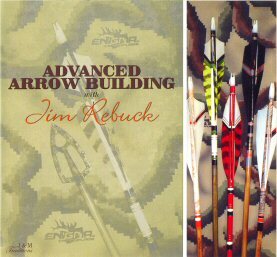 "Advanced Arrow Building" is available from J & M Traditions, RR1 Box 185F Cherrytown Rd, Dornsife, PA 17823 (1-570-758-2190). Congratulations to Trueflight's V.P. 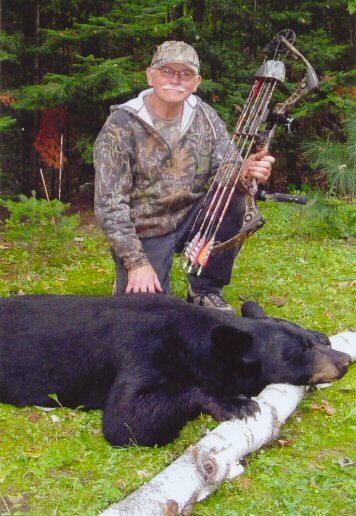 and General Manager, Bob Link who shot a beautiful bear just a few miles from our plant in Northern Wisconsin. Bob spent several months in scouting and planning this hunt. He probably hiked a total of 50 miles in that time, looking for the perfect location. When the season opened, all that work paid off big time. The first morning as he walked in to his hideout, Bob heard a snort and the unmistakable sounds of a bear sauntering away from his stand. The next morning, Bob got up even earlier... being "smarter than the average bear..." (and having a better alarm clock). When the bear showed up, Bob was ready. It took only a single lung shot. Bob waited several hours, then he and a friend followed a good blood trail less than 50 yards to find Mr. Bear peacefully passed away. Text and Photos copyright 2008, Trueflight Mfg. Co., Inc.